Lindsey Peavey is a graduate student at the University of California (and formerly from the Duke University Marine Lab) who studies the ecology of large marine vertebrates, including sea turtles. She is currently tracking the foraging behavior of Olive Ridley sea turtles in the open ocean. Funding for this project will go towards covering travel expenses, satellite tracking tags, and supporting research interns. As a nice bonus, her home institute will match funding, so your donation will count double. It’s a good enough project that we’ll even forgive her misuse of the term “deep” for “open ocean”, because we can’t all be as poetic as deep-sea biologists. Go check out Lindsey’s project page and pitch in to help a new graduate student get her research off the ground. While the pictures are real, the e-mail is misleading. 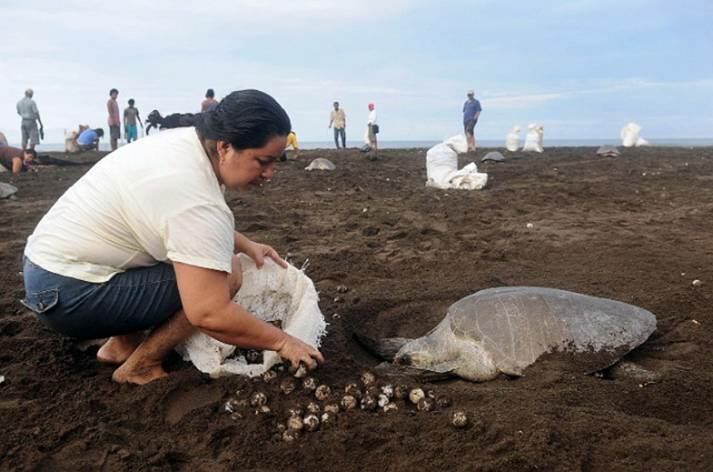 They show a sustainable, legal turtle harvest that actually helps the Olive Ridley turtle population. Our favorite observational nerd, Christie, has a thorough break-down of the what’s really going on and the Costa Rican Tourist Bureau has released further information. It’s a shame that a few people more interested in sensationalism than the truth are hurting the efforts of dedicated and effective conservationists.